"Wine Spectator" has rated the wine "Poderi Aldo Conterno Romirasco Bussia, Barolo DOCG, Italy" the vintage 2012 on 31.03.2017 with 92 of 100 points. "Falstaff Magazin" has rated the wine "Poderi Aldo Conterno Romirasco Bussia, Barolo DOCG, Italy" the vintage 2012 on 25.11.2016 with 95 of 100 points. "Wine Enthusiast" has rated the wine "Poderi Aldo Conterno Romirasco Bussia, Barolo DOCG, Italy" the vintage 2012 on 10.01.2016 with 92 of 100 points. "Wine Spectator" has rated the wine "Poderi Aldo Conterno Romirasco Bussia, Barolo DOCG, Italy" the vintage 2011 on 31.12.2015 with 93 of 100 points. "Falstaff Magazin" has rated the wine "Poderi Aldo Conterno Romirasco Bussia, Barolo DOCG, Italy" the vintage 2011 on 27.11.2015 with 94 of 100 points. "Robert Parker The Wine Advocate" has rated the wine "Poderi Aldo Conterno Romirasco Bussia, Barolo DOCG, Italy" the vintage 2011 on 29.06.2015 with 95 of 100 points. "Wine Enthusiast" has rated the wine "Poderi Aldo Conterno Romirasco Bussia, Barolo DOCG, Italy" the vintage 2011 on 10.01.2015 with 94 of 100 points. "Wine Spectator" has rated the wine "Poderi Aldo Conterno Romirasco Bussia, Barolo DOCG, Italy" the vintage 2010 on 15.12.2014 with 97 of 100 points. "Falstaff Magazin" has rated the wine "Poderi Aldo Conterno Romirasco Bussia, Barolo DOCG, Italy" the vintage 2010 on 21.11.2014 with 95 of 100 points. "Robert Parker The Wine Advocate" has rated the wine "Poderi Aldo Conterno Romirasco Bussia, Barolo DOCG, Italy" the vintage 2010 on 01.07.2014 with 98 of 100 points. "Wine Enthusiast" has rated the wine "Poderi Aldo Conterno Romirasco Bussia, Barolo DOCG, Italy" the vintage 2010 on 10.01.2014 with 96 of 100 points. "Wine Spectator" has rated the wine "Poderi Aldo Conterno Romirasco Bussia, Barolo DOCG, Italy" the vintage 2009 on 31.12.2013 with 94 of 100 points. "Falstaff Magazin" has rated the wine "Poderi Aldo Conterno Romirasco Bussia, Barolo DOCG, Italy" the vintage 2009 on 22.11.2013 with 96 of 100 points. "Robert Parker The Wine Advocate" has rated the wine "Poderi Aldo Conterno Romirasco Bussia, Barolo DOCG, Italy" the vintage 2009 on 28.06.2013 with 96 of 100 points. "Wine Spectator" has rated the wine "Poderi Aldo Conterno Romirasco Bussia, Barolo DOCG, Italy" the vintage 2008 on 28.02.2013 with 96 of 100 points. "Falstaff Magazin" has rated the wine "Poderi Aldo Conterno Romirasco Bussia, Barolo DOCG, Italy" the vintage 2008 on 22.11.2012 with 97 of 100 points. "Vinum Wine Magazine" has rated the wine "Poderi Aldo Conterno Romirasco Bussia, Barolo DOCG, Italy" the vintage 2008 on 01.11.2012 with 17 of 20 points. 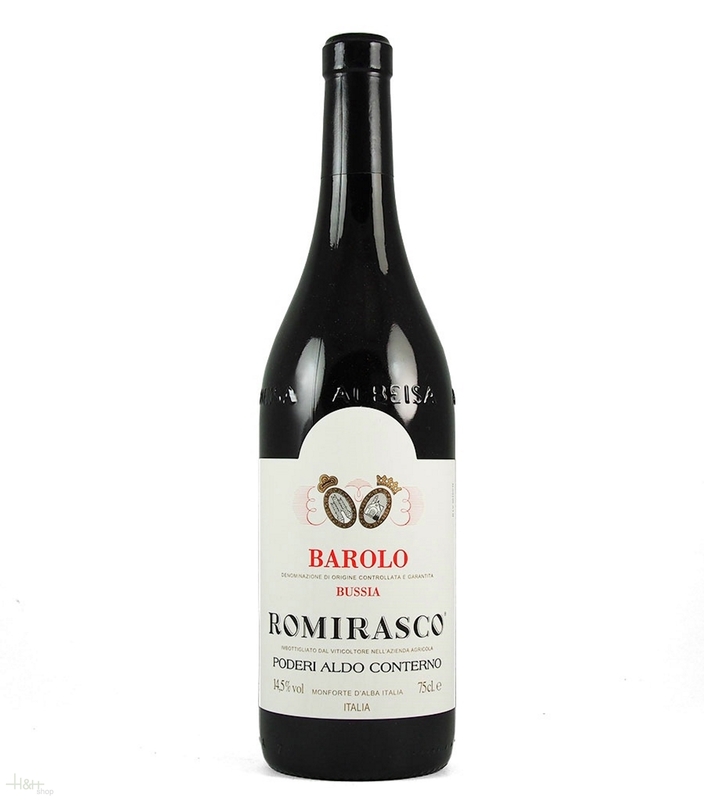 "Robert Parker The Wine Advocate" has rated the wine "Poderi Aldo Conterno Romirasco Bussia, Barolo DOCG, Italy" the vintage 2008 on 26.04.2012 with 96 of 100 points. "Robert Parker The Wine Advocate" has rated the wine "Poderi Aldo Conterno Romirasco Bussia, Barolo DOCG, Italy" the vintage 2004 on 31.03.2012 with 95 of 100 points. "Wine Spectator" has rated the wine "Poderi Aldo Conterno Romirasco Bussia, Barolo DOCG, Italy" the vintage 2006 on 31.03.2011 with 97 of 100 points.